Natalie saw the older man approaching well before he crested the hill to the Emerald Wing. Natalie hurried to meet him. It was rude to gawk, but she couldn’t help wondering what had happened to Sohan Shadowbane. “Hm. We’ll see.” A chill ran down her spine at his calm delivery. Did you love Wings of Exile? 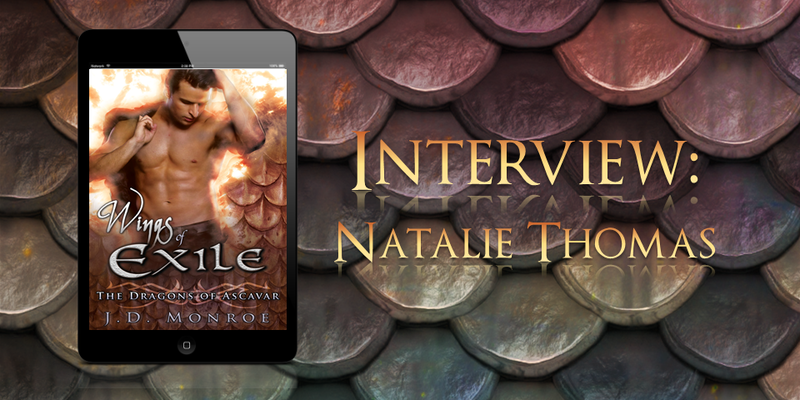 Want to know more about the ferociously loyal Natalie Thomas? Tune in for this interview! As always, interviews may contain mild spoilers. 1. Hi Natalie! Thanks for sitting down to chat with me. Can you tell me a little about yourself? My name is Natalie Thomas. Until about a month ago, I was working for my best friend Thea. I dabble in graphic design, which is how I started working for her gym, but I ended up running the administrative side entirely. 2. Until a month ago…what changed? Basically everything? Thea went missing, a dragon showed up in my living room, and I found out I wasn’t fully human. So that was an interesting few days. 3. Not human? Okay, you have to tell me more. I know, right? I never knew my father growing up. My mom used to just say things didn’t work out with him, but I suspect she had a fling that had some unexpected consequences, namely me. She married when I was little and had my brother, but they were divorced when we were little. Anyway, I never thought too much about my dad until all this happened. I met Erevan while I was trying to find out what happened to Thea. He kept trying to do this mind control thing, which he says isn’t mind control but is close enough that the semantics don’t matter. And it didn’t work on me for some reason. But he knew it wasn’t him…it was me. And not long after that, we met a dragon healer who knew instantly. She could smell it in my blood. I’m a hybrid, specifically sul-kadi, which means my father was a dragon. 4. Did that totally blow your mind? Oh yeah. I mean, I had no idea what it meant at first. In the span of what, forty-eight hours, I found out that dragons real and I had one for a dad. But surprisingly, the dragon community is pretty awesome about it. They tell me that back in their world, some people looked down on hybrids, but most people here are down with it. It changed me for sure; I have an affinity for lightning, which makes me feel a little like a superhero. It’s a little scary, but honestly I got used to it fast. Now it feels normal. And it gives me the ability to protect people, which is cool. 5. You’ve mentioned Erevan a couple times. Tell me about your relationship. (laughter) If I’m being honest, I didn’t like him at first. He struck me as arrogant and rude. I found out later that he was trying to keep me out of the investigation so I didn’t get hurt, but he went about it all wrong. He learned quick that telling me no wasn’t going to fly, especially when it involved someone I cared about. But I realized quickly that we had that in common. He has this urge to protect, and he’ll be infuriatingly stubborn about it. He’s fearless when he believes in something. 6. Is it weird to date a dragon? It can be, although he’s mostly a normal guy. He’s always hot. I mean, you’ve seen him! (laughter) But seriously, he’s your textbook dragon, breathes fire and all that. So he’s always warm, and sometimes when he wants to snuggle I have to prepare for a sauna. 7. Judging by your smile, it doesn’t sound like you mind very much. Busted! We’ve been so busy with the Skywatch that we haven’t gotten to spend a ton of time alone, but we went away for a weekend not long ago, way out in Colorado where there was no one around for miles. He transformed, and we just flew for hours under the night sky. It felt like we were the only two living beings in the entire universe. He’s also a sweetheart, although he likes to think he’s tough. And he won’t tell you this, but he likes the girliest coffee in the universe. The more whipped cream and caramel, the better. He makes me order it sometimes so the barista thinks it’s for me. 8. So how has your life changed with the whole dragon thing? Everything changed. We were the ones who discovered how the Chosen were kidnapping dragons to drain their blood, and we shut down their facility in North Carolina. After that, the queen asked if I would stay and work with them. Even if things hadn’t worked out with Erevan, I would have done it. Before all of this, I felt like I was drifting. It wasn’t a bad life, but I felt unfocused. It was like I was always just waiting for the wind to change and carry me wherever I would go next. But this gave me a sense of purpose, and for the first time, a place where I really belonged. I guess it sounds weird. I know so little about the Kadirai still. But I feel like I’m at home, more than I ever have before. 9. Have you been learning the language? I’m trying, though everyone here speaks English, too. They try to be polite and speak English when I’m around, but I’ve been working on my own when I have time. We have a couple of Wanderers that meet with me a couple days a week. I help them with English, they help me with Kadirai. They taught me something really beautiful, and I think I almost made Erevan cry. (He claims he had something in his eye.) Sozh falira n’idin dan tam. It’s not a perfect translation, but it’s a way to say “I missed you.” It means something like “my sight was dull without you,” like everything is gray when you’re gone. 10. I know you’re busy with your work. If you could give my readers one bit of advice about love, what would it be? Oh man, that’s a lot of pressure. I think it would be that the right person is going to make you feel safe and loved, and that you already deserve what they have to give, rather than you having to change to be worthy. If someone makes you feel like you’re not good enough for them and you have to be a different person to meet their standards, that’s not your person. I’ve struggled with body image for a long time, and my last boyfriend didn’t help. Erevan cut right through that, and even though he’s insanely gorgeous, I don’t feel like I’m less than him. He makes it clear that he loves me and desires me for exactly who and what I am. I never thought I would find that, but here it is. 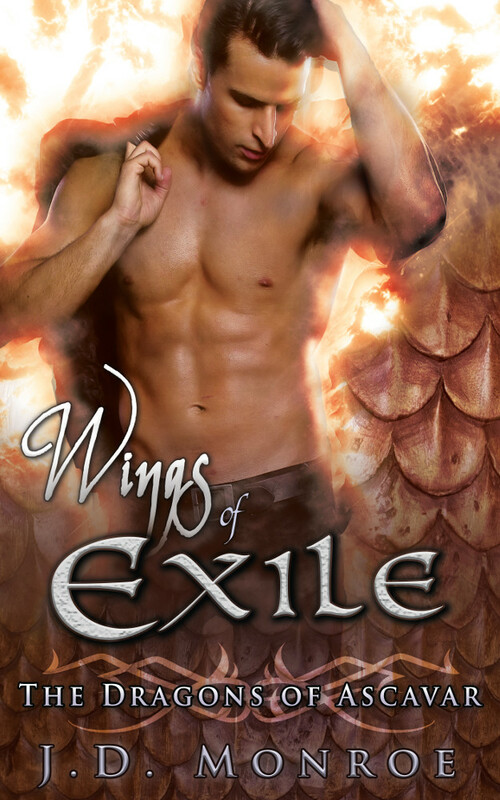 Check out WINGS OF EXILE, the story of Erevan Skyblaze and Natalie Thomas! Learn more about the language of the dragons here!